Our first report on how to tackle the recession we saw coming was published in July 2008. 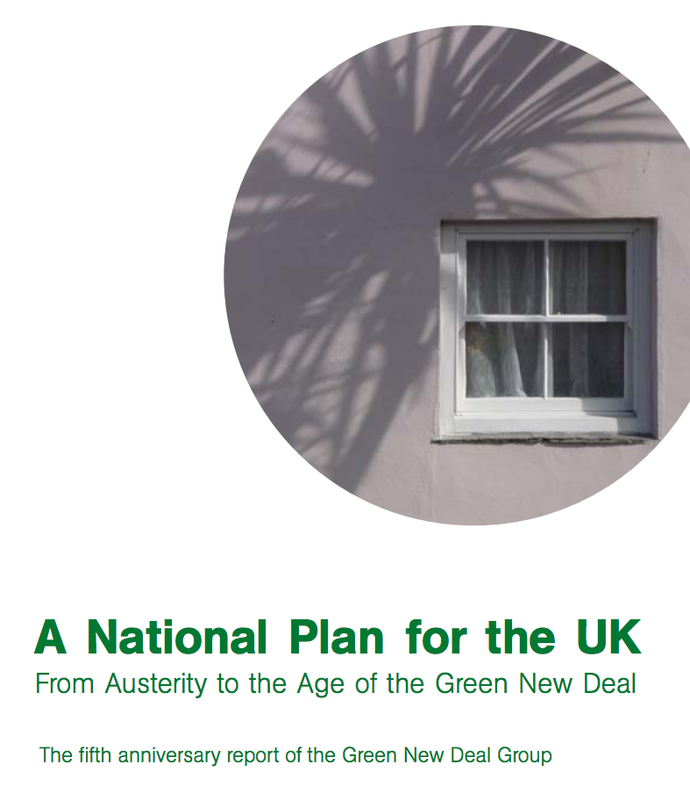 The purpose of this report is to advance a much-needed debate about how to move the UK out of the counterproductive politics of austerity and into the age of the Green New Deal. This is a matter of utmost urgency. If it isn’t introduced rapidly, we are likely to enter another economic slump. A Green New Deal could be implemented now if the political will existed. It calls initially for a £50 billion a year investment programme to boost economic activity, in a way which provides jobs on a living wage in every community in the UK, while reducing our ecological impact. The new found 'growth' in the economy does not change our argument, at all. Five years ago we wrote and published the Green New Deal. In our report, begun in the summer of 2007 before the full extent of the financial crisis had become apparent, we called for a joined-up package of measures. They were designed to power a renewable energy revolution, create thousands of green-collar jobs and rein in the distorting power of the finance sector, while making more low-cost, patient capital available for pressing social and economic priorities. We are quite sure that a credit bubble delivering a housing bubble and a rash of car buying will not solve the problems in our economy. The Green New Deal programme calls initially for a £50 billion a year programme to boost economic activity in a way which provides jobs on a living wage in every community in the UK, while reducing our ecological impact. To begin with, this involves putting in place a nationwide project to make every building in the country energy efficient and building hundreds of thousands of new, affordable, sustainably sited, energy-efficient homes. What we shows is that such a programme is easily affordable through a range of measures including Green QE, tackling the tax dodgers, increasing the tax take by stimulating employment and providing a safe haven for pension fund investments and that it is choice that these opportunities are not followed. Our proposals would provide a wide range of jobs in every corner of the UK, contribute to solving the housing crisis, improve the UK infrastructure and promote energy and resource-use efficiency. It is hard to imagine any voter in the forthcoming election not wanting to support such a programme, since it would reduce the need for welfare benefits whilst revitalising and transforming local economies. We look forward to engaging with those from all political parties, and none, who share that vision, and with those who need persuading. I’m a big believer in a Green New Deal Richard. I believe the Australian Labor Party lost a wonderful opportunity to do something similar in Australia in 2008. They rightly pushed through a fiscal stimulus, but they could have done this at the same time as pushing through the Green agenda they supposedly espoused. They unfortunately didn’t. One argument I get thrown at me when proposing such a reform (and I must confess I don’t have a good answer), is “governments aren’t capable of and shouldn’t be picking ‘winners'(companies/individuals developing new sustainable technologies). I agree that the argument, that the ‘market knows best’ doesn’t hold true as far as I’m concerned. But how does a government ensure it doesn’t pick ‘losers’? How does an incumbent government develop the skill-set to enable it to develop a new sustainable energy solution? The Australian govt. got kicked out because of its Green policies that were being seen to hurt the interest of the average Australian by exporting jobs, by ramping up energy and fuel costs. Until the Left address those issues, more than a few people will always see the Green Deal as simply a way for HMG to increase the tax take and hammer job prospects – not a good mix.